As is usual,this was prompted by a Twitter/Facebook exchange or commentary. 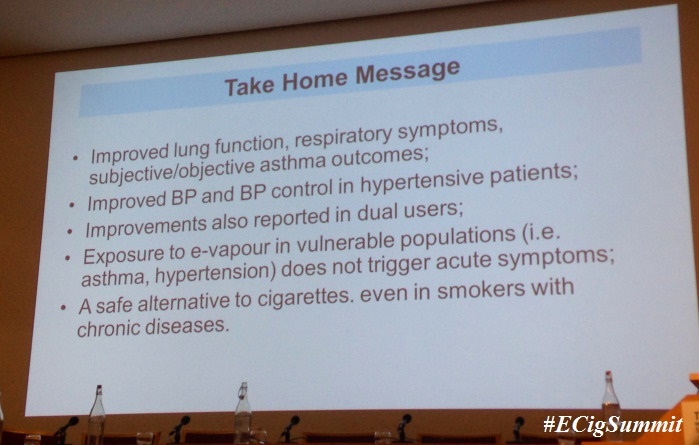 In this case it was a reference to the #ecigsummit held on 12th November 2015 and a slide shown by a spokesperson from the UK Department of Health. Stakeholders were listed on the slide, perplexingly, but all to commonly the most important key stakeholders were omitted :-CONSUMERS…. Professor Simon Chapman of the University of Sydney has used his BMJ blog platform to mount a quite personalised attack on my views on e-cigarettes drawing bizarre conclusions from imagined inconsistencies in statements I made about completely different things separated by 15 years and a lot of change. I’ve submitted a comment to the BMJ, but for all I know it will be held in moderation for days while the blog is circulating freely. So here is a copy of my attempt at a dignified response. “Much has changed since we ran the inaugural Summit in 2013, when calls for medicinal licensing and outright bans on e-cigarettes were dominant”. Reading that in the introduction and welcoming statement in the e-cigarette summit programme highlights, at least in the UK, just how far things have come. When you have the likes of Professor Ann McNeill, Professor Robert West, Professor Linda Bauld, Professor Marcus Munafò, Dr Konstantinos Farsalinos, Professor John Britton, Professor Peter Hajek, Professor Ricardo Polosa talking about e-cigarettes folk sit up and listen…. Here are some images of some important slides from various presentations at yesterday’s E-cigarette Summit. Many interesting points were raised and I recommend everyone to watch the sessions when they’re made available online. This year saw a hectic pace, with more speakers and more content in the same amount of time. Konstantinos alone had over 50 slides in a (theoretical!) 20 minutes. The recent rise in popularity of e-cigarettes has become a new source of worry for parents of teenagers, but upcoming federal regulations could make them less available than tobacco cigarettes.